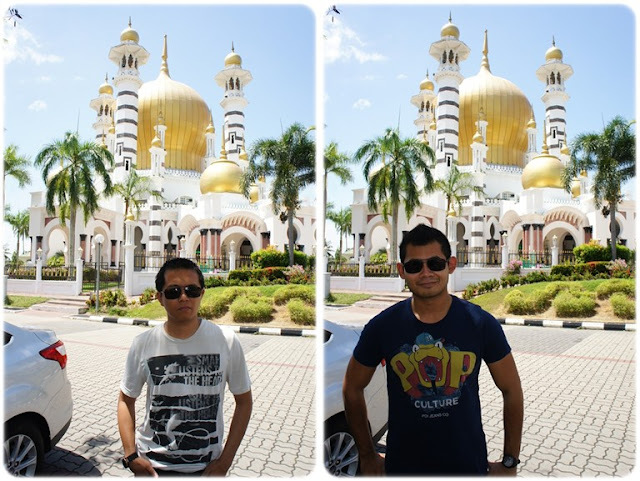 Palace of Memories are also known as Istana Kenangan in Bahasa Malaysia is located at Jalan Istana in Kuala Kangsar. Amazingly, this entire Palace was made entirely out of wood and woven bamboo, without the use of a single nail. It was built in 1931 and was served as the temporary royal quarters until a new palace was built which is the current residence of the sultan of Perak - Istana Iskandariah. Istana Iskandariah is located somewhere around Istanan Kenangan but it is not open for public. Same goes for this Istana Kenangan. It has been under a 'construction' or 'maintenance' mode for God knows... about more than 2 years already? That was the information we got from the guard. Next stop was the Ubudiah's Mosque. I really love the shape of this mosque because it is so elegant. Our last stop was at the Galeri before heading straight to kedah. It is also located at Jalan Istana. The admission fee is RM4 for adult and RM2 whereas with our magic student card, we've transformed ourselves into children! Which means RM2 only! It's one hell of a gigantic palace that was transformed into an exhibition house which stores most of Raja Azlan's belongings from head to toe, his judgment scripts, medals and trophies, uniforms and so much more. My favorite collection of his would be his watch section. Oh my God! The amount of limited edition watch that he owns was crazy. Unfortunately no camera is allowed. Of course no picture can be taken too or else I'll share it with you guys in my blog. Well, you have to go there and see it for yourself instead. Every palace will have a fountain. I wish my future house will have one too. Another building that stores all his cars and LV luggage bags and briefcase!!! Not one but roughly about 6 or more if I'm not mistaken. That's the end of ronda-ronda Perak. We move on to our next state which was Kedah. After all the hassle, we finally decided to settle down in Casa Lagenda Hotel. The price was RM105 a night for a 2 queen size bed. The room is quite comfortable. Will post a picture of it at the end of my post. After checking in and dumping poor fikry in the hotel to get some rest, the three of us headed out for a nice dinner together with Mark's sister - Sarah. Well she's studying there, hence why we were able to meet up with her. We settled for an Indian cuisine in a sort of 'high class' restaurant. But the price was more or less the same like other Indian restaurants. I find out that Sarah's car is freaking cute! She bought the angel-devilish decoration for her Mazda. It looks so damn cute can! Here's a picture of our room. Please ignore the mess on my bed.